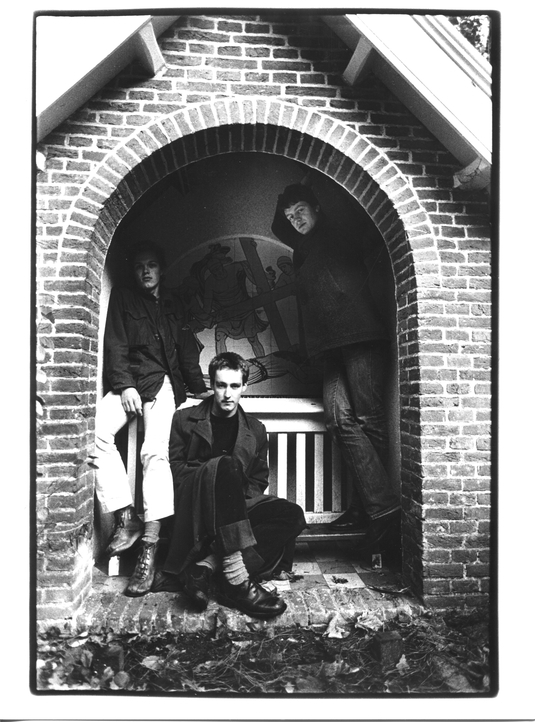 Formed in Heiloo, The Netherlands, June 1981. Influences (in no particular order): Punk/New Wave, Prince Far I/Augustus Pablo, Parliament/Bootsy Collins, Roxy Music/Eno, King Crimson/Fripp, Kraftwerk, Stanley Clarke, Weather Report, Tangerine Dream, The White Noise, Jean Michel Jarre, Synergy ('Cords'), Zappa/Beefheart, Pink Floyd ('Ummagumma' to 'Meddle'), Public Image Limited, John Foxx, YMO, Telex, Minny Pops, early Factory Records. Initially a three piece band called King Ende Shneafliet, featuring a guest drummer --who was early on swapped for a drum machine-- the group soon expanded to a five man studio collective that composed and recorded more than 70 tracks in little more than 2 years time, in always changing combinations of 2 or 3 members. Ende Shneafliet released 3 cassette albums on the Trumpett label (also home of The Actor and Doxa Sinistra): Animals From Outer Space (TRUM 0003 / September 1981), Harde Winters Anno 1982 (TRUM 0009/ February 1982) and Symphoy Romant (TRUM 0016 / March 1983). They played a live set featuring all previously unheard material for the VPRO radio show Spleen on September 13 1983, which was released on cassette through Staalplaat (TRUM 0020-ST00O /1988). Shortly after their performance for the VPRO they called it a day. Members: Edwin Brinkhuis, Frank Brinkhuis, Brian Dommisse, Hanjo Erkamp, Jan Popma.